I finished painting this little dinghy a few days ago, but I’ve been without the internet since Monday – the Hub remaining a sullen orange instead of blue – so I’ve only just added it to Gallery 2018. 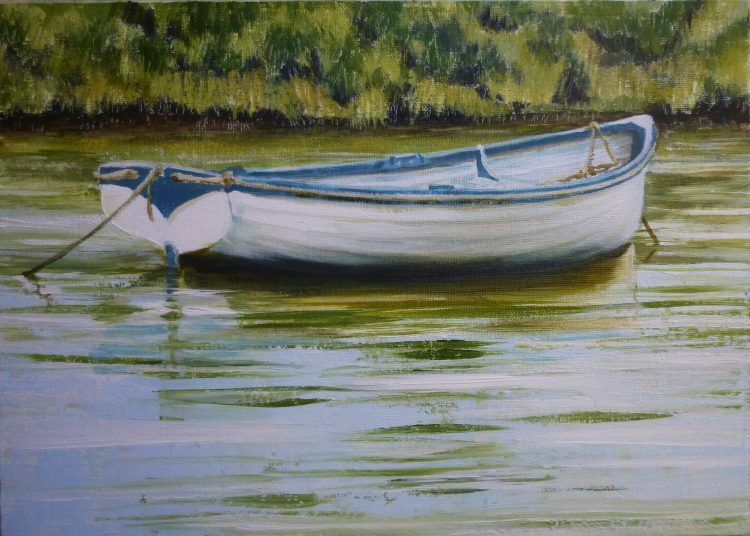 This is Blackwater Dinghy by the bank, and is one that I found last summer but have only just got round to painting! Art Space in October: Yesterday I met up with Naomi Brangwyn in Woodbridge to have a good chat over our shared autumn 2018 exhibition at Art Space. Naomi has invited printmaker Mandy Walden to join us – you might like to check out her colourful prints of the Suffolk coast at www.mandywaldenartistprintmaker.co.uk We will also be having one or two 3D artist showing with us, but are still trying to decide who! We were both really impressed with the gallery, which is in The Thoroughfare almost opposite The Georgian Coffee House. We were lucky enough to meet the owner when we called in, who showed us round and discussed some of the organisational queries we had. It is really exciting to be planning this new venture – but I need to get lots of work done this year in readiness!